Intending to develop your outdoor for spare time parties? If you just love the BBQ feasting and parties and really want to setup your outdoor home portions for bigger types of fun then this DIY BBQ pallet deck project would all be a rocking choice! 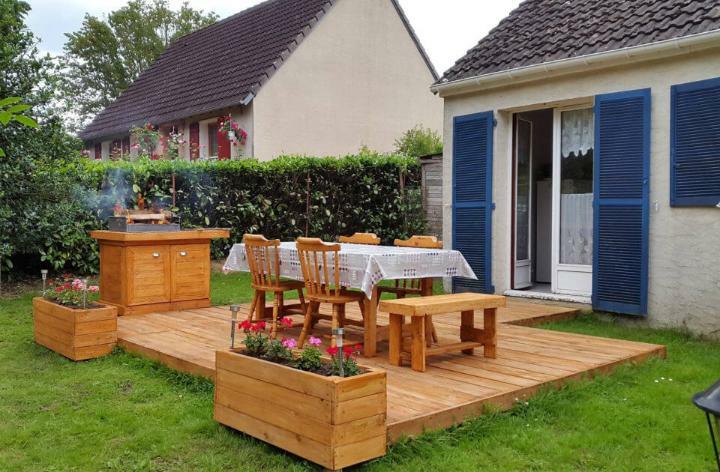 In this project, a raised wooden deck has been installed that gives the smoother wooden floor also, this deck has been finished with 2 decorative planters work great as decorative edging of this self-installed pallet deck! 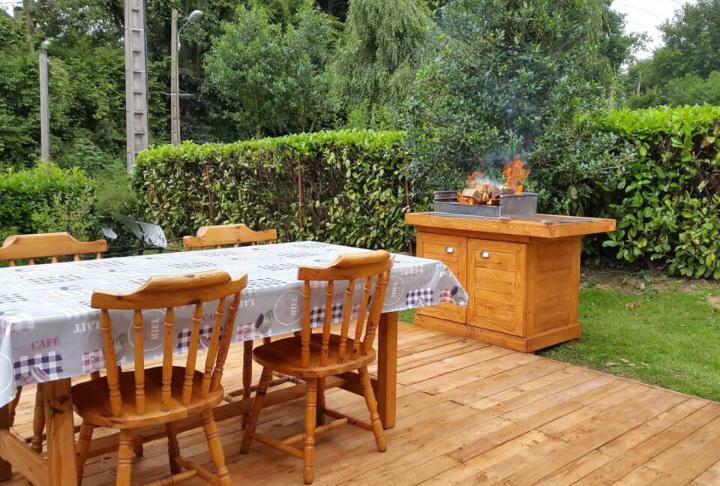 A BBQ table has just been made out of pallets, fitted with BBQ grill and also provides the mini cabinets for storage of BBQ sticks and spices! A larger pallet table with matching bench has also been fabricated where the family members and friends can make gossips while waiting for the BBQ dishes! All the assets of this project has been built at home and for free, so you can feel free if willing to clone this project for an instant party vibe at your favorite outdoor location! You should definitely copy this project if you need to gain your outdoor enchanting, party friendly and also perfect to enjoy the conversations! 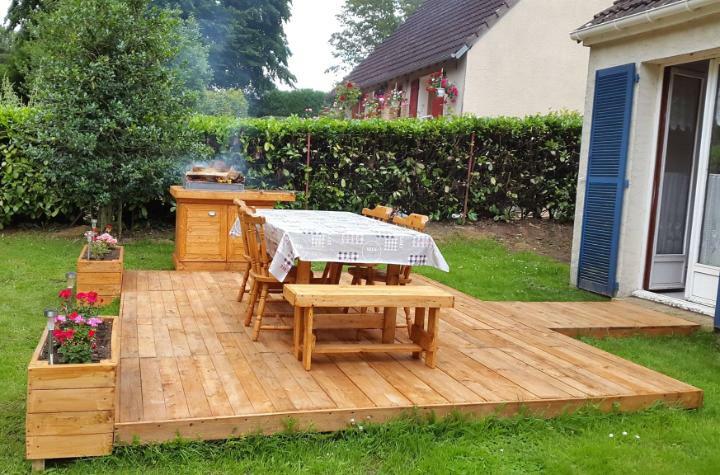 A BBQ table, a perfectly raised wooden deck with smoother wooden flooring, two pallet planters and a big wooden table are the major assets of these pallet projects! 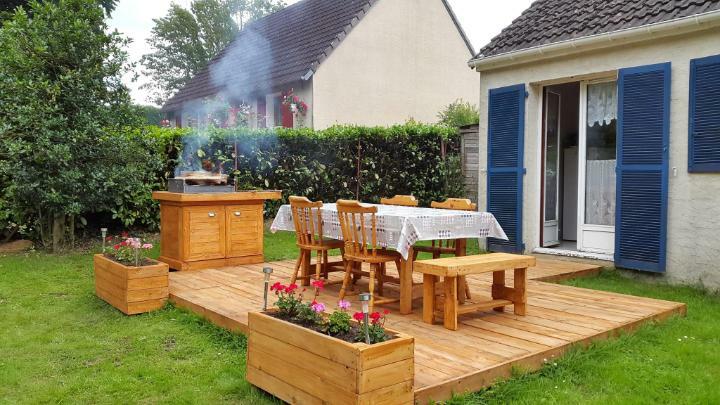 This project has been done on demand of a party friendly outdoor, so all has been made out of pallets to enjoy eating and conversations at the same time! Here except chairs, all has been made of pallets, including the planters having solar lights fixed in! BBQ table is also having sub-cabinets so it would all be easy to store the BBQ metal rods and spices inside the table! A pallet garden party lounge done in owner of party lovers! if you want a more fantastic touch to this pallet deck then you can choose a super cute pallet sofa set from these Top 104 Unique DIY Pallet Sofa Ideas ! and a wonderful and cute pallets wood made bar from these 50+ Best-loved Pallet Bar Ideas & Projects !